DO-39756-61 was succesfully added to your cart. The T-Series is available with different detector sizes, temperature ranges and thermal sensitivities to meet every requirement. Thermal imaging is a non-contact technology that measures infrared wavelengths to determine temperatures from a safe distance. A thermal imager displays an image using different colors to represent different temperatures. With the highest accuracy for its class at 2% and thermal sensitivity as low as 0.045°C, these imagers are perfect for identifying hot spots or a rise in temperature which often indicates a problem. FLIR''s thermal imagers are fully radiometric which means they measure and store temperatures at every point in the image. Each camera comes with access to robust web based software package that allows the user to transfer images onto a template for analyzing and creating of a report in pdf format. The T-series also includes built-in software which allows complete in-field analysis, reporting and file sharing capability directly from the camera. 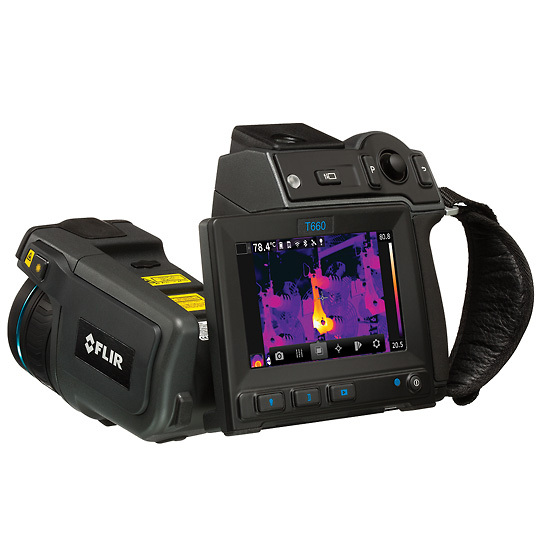 FLIR-Report a professional thermal imaging software package is sold separately and provides enhanced reporting capabilities, allowing for the easy creating of comprehensive multi-image reports with analysis of image data. MSX™ Multi-Spectral Dynamic Imaging, a FLIR exclusive. MSX adds the detail of real-time visible spectrum images captured by the built-in digital camera to thermal spectrum images, providing extraordinary sharpness, contrast and clarity previously unavailable in thermal imaging. METERLiNK® is a Bluetooth™ connection that is an exclusive feature of the FLIR T-Series cameras and select Extech instruments. Measurements from these instruments are transmitted and stored directly on the thermal image and displayed on the camera’s viewing screen. Allowing the user a quick way to review and record multiple parameters at the location being inspected. UltraMax gives you 4X the resolution and combined with FLIR’s exclusive MSX Technology it substantially enhances IR images when imported into FLIR Tools software. UltraMax resolution: 1,228,800 pixels (1280x960). SD memory card, Li-Ion rechargeable battery with 100 to 260 VAC adaptor/charger, 2-bay battery charger, USB mini-B cable, video cable, sun shield, stylus pen, camera lens cap, and transport case.